The key to keeping my tax preparation fees low is efficiency. The more efficiently I can prepare tax returns, the lower I can keep my prices. As a client you can play a major role in my efficiency by being organized and involved in your own tax preparation. 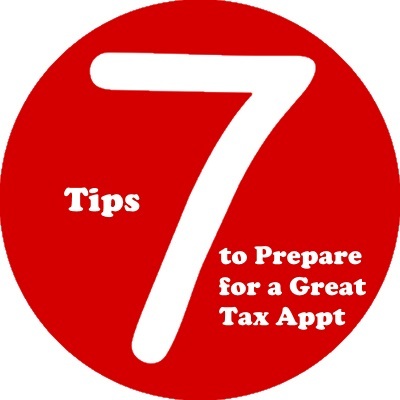 Below are 7 tips to help make your tax preparation experience as smooth and efficient at possible. Schedule Your Appointment at a Time that is Good for You. If people in Virginia Beach have one thing in common it is that we are busy. Everyone I know is busy. Getting to the tax preparer seems like just one more thing on your never-ending to do list. Try not to look at it like that. We are, after all, talking about YOUR money. Give it the time it deserves. If you're trying to wedge your tax prep appointment in between the dentist and picking the kids up from daycare you are unlikely to be fully engaged in our discussion. Bring Last Year's Tax Return. If I did your taxes last year I will already have it. If not, dig up your copy and bring it with this year's documents. Your state return(s), too. It can be really helpful for me to see how you filed and what you claimed last year. It's also the only way for me to know if you had some losses last year that you can get credit for this year. Trust me - you want me to have this information. I might even spot a mistake on your prior return that would entitle you to a refund. Check our Tax Tools section for useful checklists and spreadsheets! Total Your Receipts (but bring them with you). If you are claiming deductions for medical expenses (sched A), unreimbursed employee expenses (sched A), charitable donations (sched A), business expenses (sched C), or rental property expenses (sched E) make sure you have all of your expenses totaled on a spreadsheet or ledger before you get here. Bring the receipts, too. The totals are usually sufficient, but there may be something we need to dig into deeper, and the receipts will help with that. Have the Personal Information for Everyone Listed on the Tax Return. The IRS will match the name and social security number of everyone listed on the return as soon as it is submitted, and your return will be rejected (usually within 30 minutes) if the information does not match what they have on file. We also need dates of birth for everyone on the return. Make sure you have that information with you or the return cannot be filed. Know How You Want to Handle the Money. I'm sure you're a swell person, but I still need to get paid for my services. I take cash, checks, credit or debit cards. (Note: I will not take my fees from your refund. You have to pay for tax preparation before your return(s) will be filed.) If you are getting a refund know how you want to receive this from the IRS and/or state. If you want it direct deposited into your bank account you'll need to have the account number and the bank's routing number with you. Ask Questions. That might not seem like a way to improve efficiency, but it actually is. Everyone knows something about taxes, even people paying to have them done for them. On the flipside, no one knows everything about taxes, even people who make a point of studying them. Ask questions, challenge my assumptions, dig into an issue until you are satisfied with my answers. It is far more efficient for me to do a little research and get your taxes right the first time than it is to do them over. If you can do those seven things, then I can remain a very efficient tax return preparer and keep my prices low for years to come.